Three different pairs of Leather Shirt Cuffs. Each matching pair is heavily tooled and in very good condition. 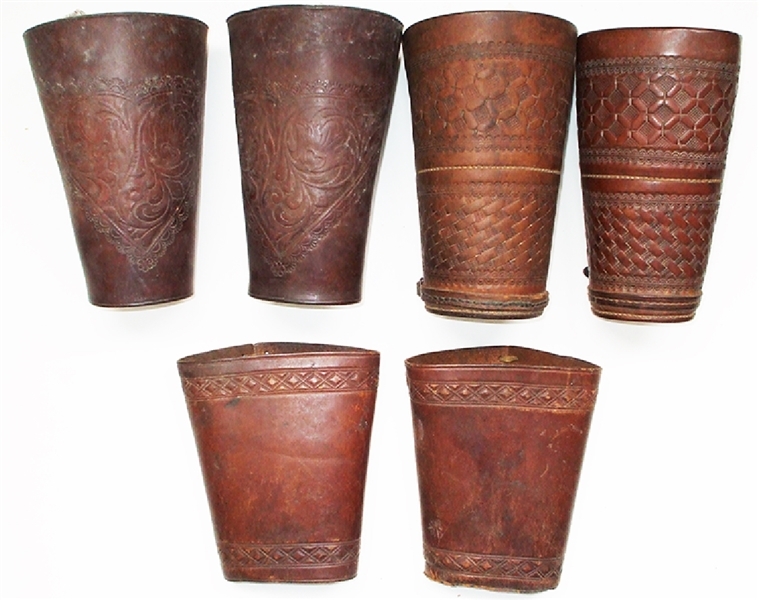 the group includes; Conical shaped, 6” tall x 3-1/2” diameter at the wrist end, 4-1/2” at the forearm end, has snap with patent 1885, and sinew lace, VG; ... plus, Conical shaped, 7” tall x 3-1/2” diameter at the wrist end, 4-1/2” at the forearm end, has leather strap with small buckle to tighten at wrist, VG; Conical shaped, 7” tall x 3-1/2” diameter at the wrist end, 4-1/2” at the forearm end, has leather strap with small buckle to tighten at wrist, VG. All three pair are dry but will clean up nicely, nd., likely c1875. Cowboy cuffs are worn to protect the wrist, forearm, and shirtsleeve from injury or damage caused by ropes, branding irons, brush, wire fencing, and other hazards.